According to Wikepedia, "International Women's Day (IWD), also called International Working Women's Day, is marked on March 8 every year. In different regions the focus of the celebrations ranges from general celebration of respect, appreciation and love towards women to a celebration for women's economic, political, and social achievements." We are presenting postcard US-1923857 to Ukraine in commemorating International Women's Day by celebrating Native American women. 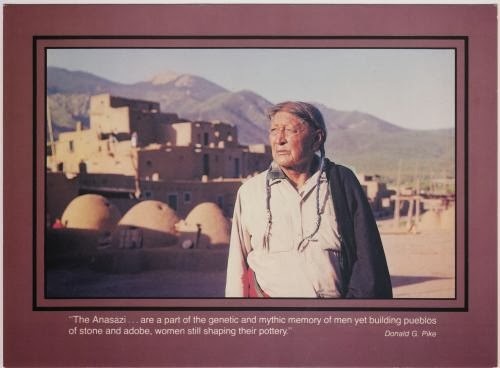 The postcard features an Anasazi Indian woman, who belong to one of the Ancient Pueblo peoples centered on the present-day Four Corners area bordering southern Utah, northeastern Arizona, northern New Mexico, and southwestern Colorado. As shown on the background of the postcard, they lived in elevated pit houses, pueblos, and cliff dwellings where they could lift entry ladders during enemy attacks.